Vous ne trouverez pas une maison de plage qui est plus proche de la plage ou du Golfe! Depuis le pont avant sur le sable, ce est vraiment une maison en bord de mer. Aucune promenade n'a plus accès à la plage ou nécessaires. Cette maison de plage a un salon confortable avec une vue magnifique de la plage. Le porche est parfait pour se asseoir et donnant sur la plage dispose également d'une terrasse à l'étage au large de la chambre principale. Cette maison est parfaite pour les familles multiples. La location dispose de 3 chaises supplémentaires chaque jour. Cela se compose de 6 chaises et 3 parasols qui sont mis en place chaque matin et pris à la plage chaque après-midi, sauf les jours d'arrivée et de départ et de la météo. I bring my two children's families down for the week and have a fun and relaxing stay. We love the beach and we love all of the restaurants in the area. Our family had a wonderful stay at Katherine’s Sandcastle. It is very spacious and well-equipped. The owner is very responsive to questions, etc. I would definitely recommend! Our family has stayed in many different vrbo’s along 30A and Katherine’s SandCastle is by far our favorite. You simply cannot get closer to the sand and beach. The home has a wonderful layout with lots of bed options that fit our goup of 10 perfectly with room to spare. 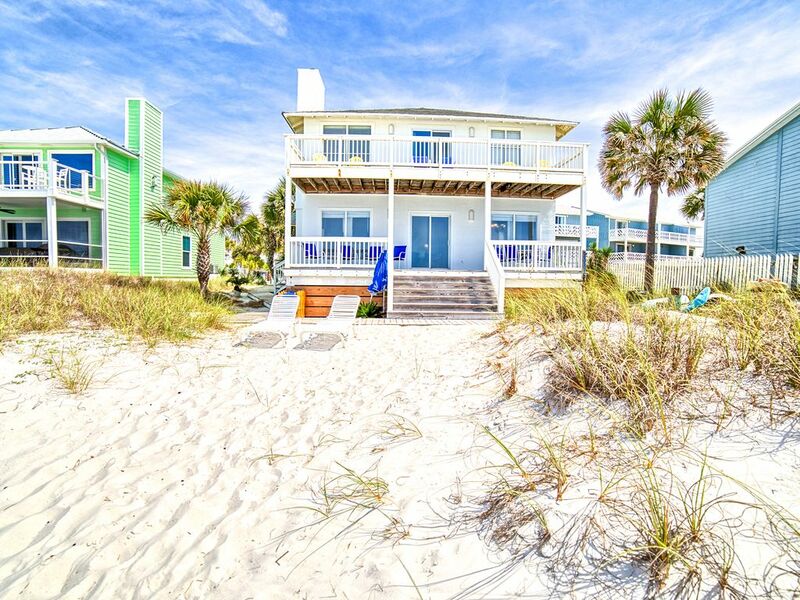 The location is great, being super close to Panama City Beach in one direction and all of the quaint 30A beach towns right around the corner. Plus an added bonus of chairs & umbrellas available for guests. We will definitely be back! A big thank you to Damon & family for ensuring that our stay was a pleasant one. We had 11 family members together and had a wonderful time. The owners were good to work with. Great beach service set up every day and fantastic location. We love coming here!!! We were down for our sons wedding at Inlet Beach. It was perfect location, perfect house! Had everything we needed! We have a home in Laguna Beach, but if we didn’t, we would stay here every time!! Thanks for sharing your home with us and making our wedding week celebration perfect! !